Don’t worry, you didn’t miss out on a December SRC reveal. The group decided to take off for the month of December because of the holidays. However, we received our assigned blog at the end of November. Which created a bit of a problem for me. It gave me WAY too much time to go through the recipes trying to choose one. For this month, I was assigned Food Babbles. I’ve visited Kate’s blog before as she also participates in the Improv Challenges, but this was the first time I really clicked around to see what type of recipes she had on her blog. I was immediately drawn to her posts tagged MuffinMondays. I’m a bit of a muffin addict. They are probably my number one breakfast food because if you really think about it, the only difference between a cupcake and a muffin is frosting. So you’re kind of eating dessert for breakfast. Look, it makes sense in my head, okay? Either way, I was incredibly giddy over finding all of the muffin recipes. I believe I have now found my go-to spot to search for new recipes. We won’t talk about how many I’ve already printed out, okay? As much as I unintentionally gravitated toward the sweet muffins, I was intrigued by the savory muffins and figured there was no better time than the Secret Recipe Club reveal to try out a savory muffin. 1. Preheat the oven to 375. Line a muffin pan with paper liners. 2. Heat a small skillet over medium heat. Add the jalapeno, poblano and chorizo and cook, breaking up the chorizo, for 3-4 minutes. Transfer the mixture to a plate and blot excess oil with a paper towel. 3. Then transfer the mixture to a bowl and stir in the cheddar cheese until combined. 4. In a large bowl, combine the flour, baking powder, baking soda and salt. Whisk the buttermilk, oil and egg together in a measuring cup then pour into the flour mixture. Stir with a wooden spoon until combined. 5. Gently fold in the chorizo mixture. Spoon the mixture into the prepared muffin tin, filling it all of the way. 6. Bake for 20 minutes or until golden. Let cool for 10 minutes before serving. A savory muffin is definitely interesting. I really like the flavors of this and the kick of heat from the jalapeno. The only thing I would do differently is a larger chop on the jalapeno and poblano so you could see them better in the muffin. These look so good! I love this combination of ingredients. 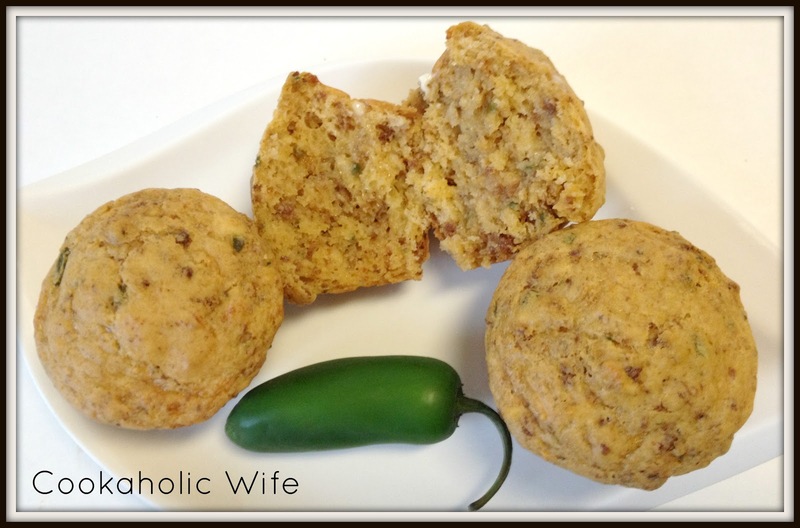 Love these muffins…I rarely make savory muffins, but when I do I'm always so happy I did…so delicious. The chorizo sounds extra tasty! I love savory muffins and the combo of these flavors sounds wonderful. I'm so glad you enjoyed delving into the world of savory muffins! And I'm also glad you liked all the muffin recipes you found on my site… there are a couple 😉 If you're a muffin lover, you should join in on Muffin Monday! Anurahadra from BakerStreet.tv runs it and it's heavenly 🙂 Glad you liked these muffins! Kate has the best blog and I just love these muffins! I too have never delved into savory muffins, and need to badly. These have Chorizo AND jalapeno and are winners in my book! OMG, you had me with the recipe title. Southwestern flavors in a savory muffin equal 5-star comfort food in my kitchen. That is one full muffin. Cupcakes, eh… muffins are perfect for b'fast!! !